An unaltered photocopy of your Report of Separation (DD-214, WD AGO, etc.) 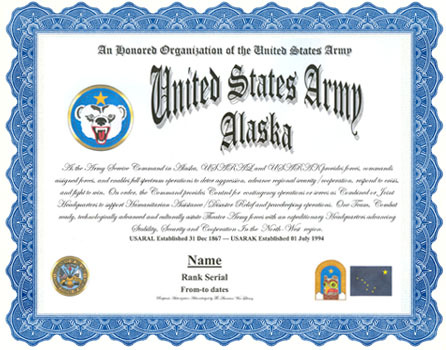 If your service with U.S. Army, Alaska is not displayed on your Report of Separation you must provide a copy of your Report of Separation -AND- a copy(s) of any military-issued document clearly displaying your service with U.S. Army, Alaska. SHOULDER SLEEVE INSIGNIA. Description: On a blue disc 2 = (6.35cm) inches in diameter, a Great Bears face affronte in white with markings in black, black nose with lips and tongue highlighted in red below a five pointed star, 5/8 inch (1.59cm) in diameter in golden yellow. Symbolism: The insignia represents the constellation Ursa Major (the Great Bear), which, according to ancient myth, is the guardian of the North Star (Polaris), depicted by the golden yellow star. Background: The shoulder sleeve insignia was originally authorized for the Alaskan Defense Command on 24 Mar 1943. It was redesignated for the Alaskan Department on 31 Dec 1943. On 1 Mar 1949 the insignia was redesignated for Headquarters, U. S. Army Alaska. 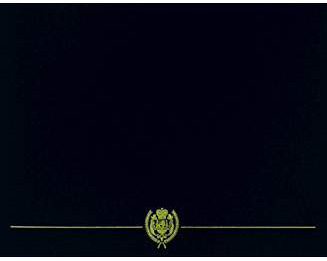 On 2 Dec 1968 the insignia was amended to delete the word "Headquarters". DISTINCTIVE UNIT INSIGNIA. Description: A gold color metal and enamel device 1 3/16 inches (3.02cm) in height overall consisting of a blue (ultramarine) enamel background, arched at the top and bearing a five-pointed gold star, the field bordered by a band of gold rays (each beveled), overall in base two white enamel mountain peaks (one on each side), in the center issuing from the base the crest of a totem pole consisting of an eagles head in proper colors facing to the right. Symbolism: The single star on the blue background stands for the North Star which also appears on the state flag of Alaska. The gold rays forming an archway symbolize the mission of the U. S. Army, Alaska, as the first line of defense in North America, and also allude to the Northern Lights. The totem pole and the snow covered peaks are symbolic of Alaska. The American eagle as depicted by the Alaskan Indian, with penetrating eyesight and exceptional hearing, alludes to the alertness and protection offered by the organization. Background: The distinctive unit insignia was originally authorized for the U.S. Army, Alaska on 11 May 1970. It was rescinded on 28 Sep 1976. The insignia was reinstated on 7 May 1996.